Wouldn't you think a black radish might, you know, be BLACK? Well maybe not, since red radishes are only red on the outside. Silly me, I thought a black radish would taste considerably different than a red radish. It doesn't. 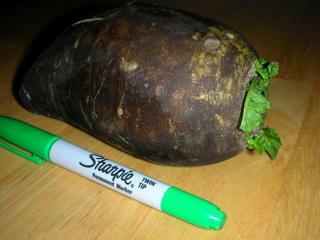 It IS however much bigger, more the size of a large sweet potato. The one in the photo weighed half a pound. This was good enough but I wouldn't go out of my way to have again. 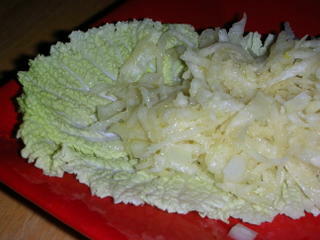 The salad itself was the same, fresh, light, enjoyable even, just not something to have again. I CAN see how it might be a refreshing to the palate, however, if paired with fatty meat. And I've got three more like this to go so look for more ideas. PS I did use some of the salad along with egg/sour cream to make a fritatta for supper. It was quite good. Mix the radish and onion in a bowl, then add the remaining ingredients. 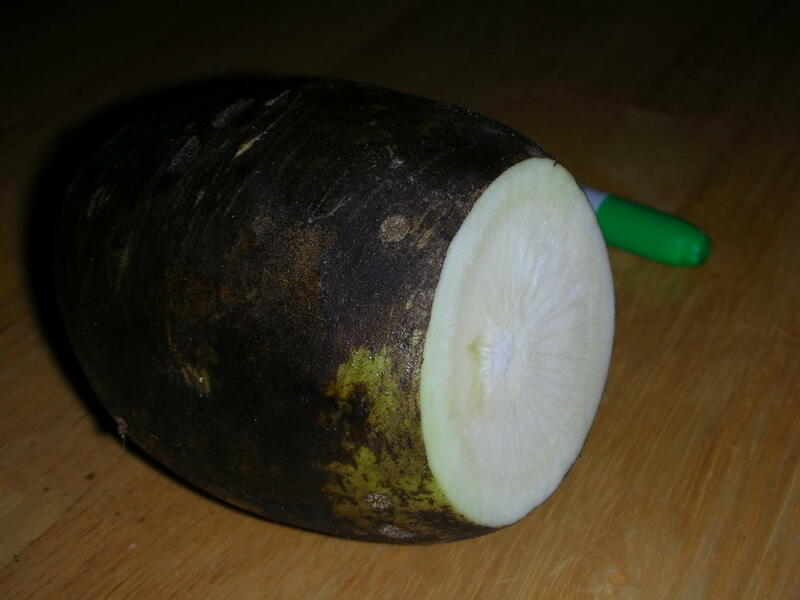 I have NEVER heard of black radish - but this is spectacular. I bet there are some great lunch options just waiting to be discovered on this site. Thanks AK! Black radish is great! Try adding some diced cukecumber to your recipe for a variation.